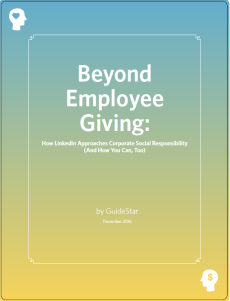 When’s the last time you evaluated your workplace giving strategy? According to a recent study, American consumers value companies they believe demonstrate a commitment to corporate philanthropy. But corporate social responsibility (CSR) is more than a just a public relations exercise to make people like your company. The preceding post is by Courtney Cherico, GuideStar’s content marketing associate. She manages their many social media channels, including this blog. To stay up to date on the latest GuideStar news, follow us on Twitter and Instagram.